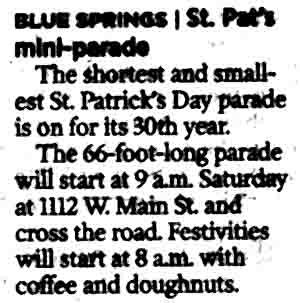 This is an article that appeared in the March 14, 2007, editio of The Kansas City Star. Blue Springs is a suburb of Kansas City. Kansas Citians take St. Patrick's Day pretty seriously. Not as seriously as Chicago or Boston, maybe, but it's a pretty big deal around here.